Photograph Galley page from Cass workshop 2009. The objective of ABaCass2012 is to facilitate uninterrupted and balanced Face-to-Face Transmissions in Contemporary Algebraic Biology, where Algebraic Biology is nothing more than algebraically flavoured mathematical communications in biology! Besides your laptop, bring plenty of paper, pens, and ideas. Also bring some hiking shoes/jacket. Be prepared to do your own cooking (there are no shops or cafes nearby). There is little (if any) phone or internet access. There is no charge for invited participants, but you may wish to bring along some of your own food, particularly if you have a special diet (eg. vegan), and some refreshments. 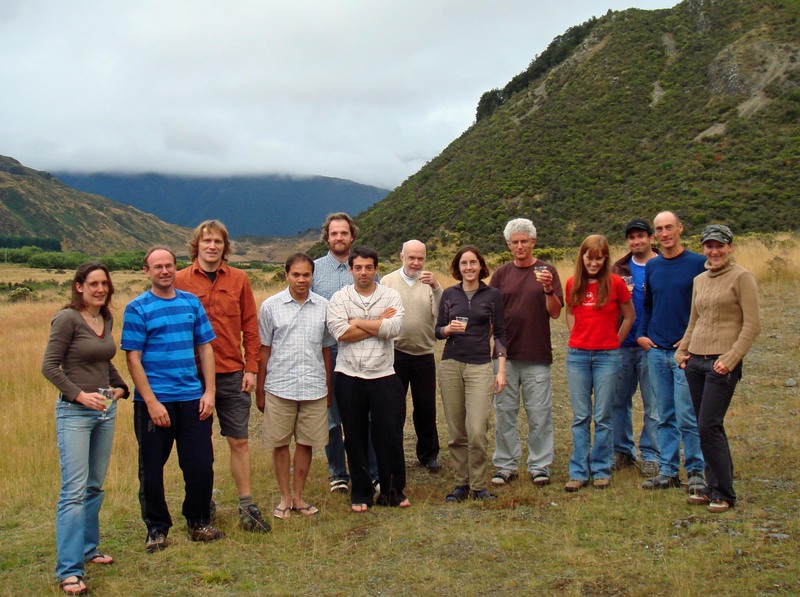 Funding from the NZ Marsden Fund and Allan Wilson Centre. There are a few tutorials to provide some structure for the exchange of ideas. Each tutorial has two parts and each part is about 1.5 hours long with a thinking/hiking/eating/relaxing break of at least 4 hours between most tutorial pairs. "The tramp climbs steeply through beech forest on a well defined track to continue climbing (above the bushline) on a tussock and rock ridge. Mt Bealey itself is 1836m high, which means a total ascent of about 1100m, some of it steep. Stunning views on a clear day." "Start above the baches at Bealey Spur and climb up through sheltering beech forest. On the way to the charming old hut, at about 1240m, the ridge opens up in places to reveal immense views over the Waimakariri River and to the mountains beyond. The hut is about a 450m climb from the cars and the round trip is about 10km. Option to continue up Hut Spur above the bushline for a bit to admire the impressive horseshoe ridge." 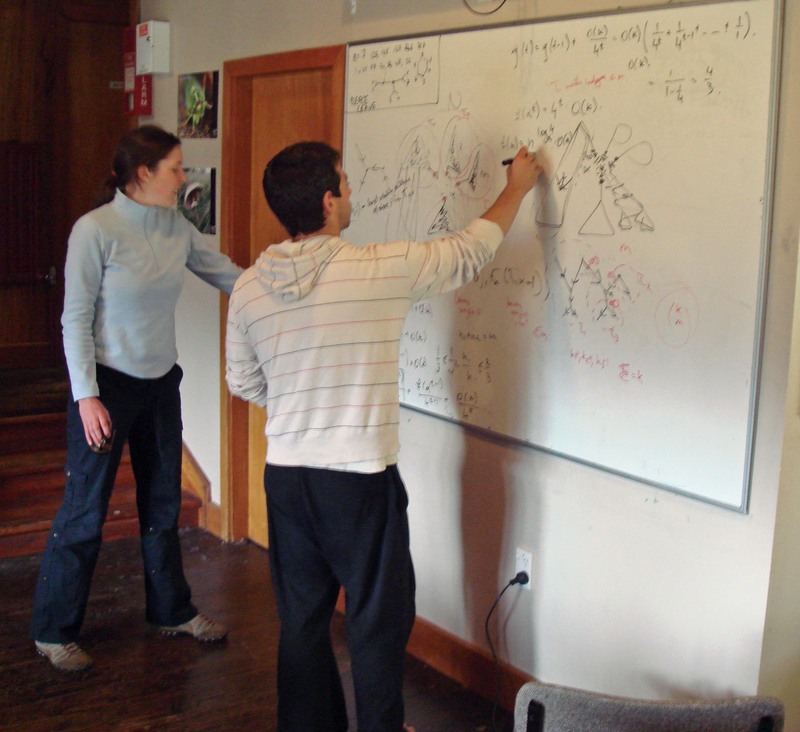 Mathematical concepts and methods in modern biology: using modern discrete models. R. Robeva and T. Hodge, editors, Elsevier Press, 2012. Friday 10th February 2012, Pack-up, Clean-up and Leave after lunch! Confirmed Participants: Joshua Collins, Mareike Fischer, Terrell Hodge, Leo van Iersel, Stefan Grunewald, Steffen Klaere, Iain Martyn, Megan Owen, Raazesh Sainudiin, Scott Schmidler, Mike Steel, Jeremy Sumner. Transportation Logistics to Erskine Carpark at 10:00AM on Saturday February 4 2012 NZST: Gabriela Aguileta (independent arrangement to Cass but never showed up) Joshua Collins (independently came to Erskine carpark), Mareike Fischer (5 minute walk to Erskine carpark), Terrell Hodge (pick-up by Stefan Grunewald), Leo van Iersel (pick-up by Steffen Klaere), Stefan Grunewald (driver), Steffen Klaere (driver), Iain Martyn (Meet at Erskine Carpark by 10:00AM and independent arrangement to Cass), Megan Owen (5 minute walk to Erskine carpark; Mareike Fischer assisted), Raazesh Sainudiin (driver), Scott Schmidler (5 minute walk to Erskine carpark), Mike Steel (driver), Jeremy Sumner (pick-up by Stefan Grunewald). Food - We cook and clean in groups to have dinner together around 1800 hours or so each day (details to be mutually agreed after lunch on Saturday). Toward this please read Mailee Stanbury's instructions to the Tenzo! (PDF) (ingredients (PDF) :: Grogery List 1 (PDF) + Grocery List 2 (TXT) + Grocery List 3 (TXT)). Make your own breakfast [cereal, muesli, milk from powder, eggs and potatos, juice, toast, spreads, tea, coffee] and lunch [sandwiches with meat, cheese and/or filafel (only for strict vegetarians) with vegetables]. All these ingredients are provided. Photograph Galley page from previous Cass workshops. Cass Field Station has bunkrooms. Please bring a sleeping bag and pillowcase. More information is available on the Cass Field Station website. Information on how to get there can be found on the Cass Field station website. We will be taking a minivan up to Cass. Please let us know if you need transport. Raazesh Sainudiin thanks Ms. Penelope Goode for a most efficient administrative support and Ruriko Yoshida for setting this meeting in motion despite her inability to be there. Last modified on Saturday, 03-Sep-2016 04:25:43 MST and served on Saturday, 20-Apr-2019 02:16:02 MST.